PHQ-9 stands for Patient Health Questionnaire Depression Module. It a screen used to assist with identifying a resident’s current and recent mood state and to help determine if any interventions or referrals need to occur. The 9 stands for the 9 criteria derived from the DSM-IV (now DSM-V) which is a diagnostic manual for those in the mental health field. The PHQ-9 is a mandatory interviewing tool for skilled nursing centers. A social worker is usually the one that would be administering the PHQ-9. The PHQ-9 is administered shortly upon admission and then several times thereafter if a resident is in a center for skilled services. It is administered after 14 days, 30 days and so forth. If a resident is receiving long term care, then the PHQ-9 is administered upon admission, quarterly and if there is a significant improvement or decline in a resident’s well-being. A resident is asked is over the past 2 weeks, has he/she been bothered by any of the following problems. There are 9 questions to be asked that are answered with a yes or no. If a question is answered yes, then there is a follow-up question asking the frequency ranging from a 0 to a 3. The scoring ranges from 00 to 27. 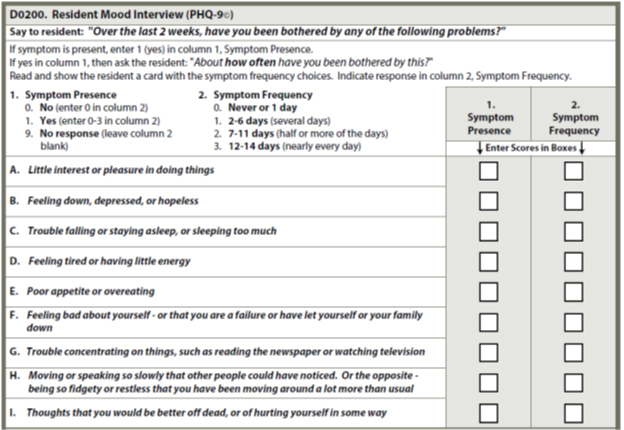 The tally of the scores represents a resident’s tentative mood state for depressive signs/symptoms. This questionnaire is a tool to assist with providing a holistic presentation of a resident in order to ensure the most appropriate plan of care. Here at The GRAND, there are resources available to assist a resident with depression signs/symptoms during their stay with us such as scheduled activities, pet therapy, counseling services, a Medical Director to oversee any medication management needs and an ample amount of caring staff members to talk with. 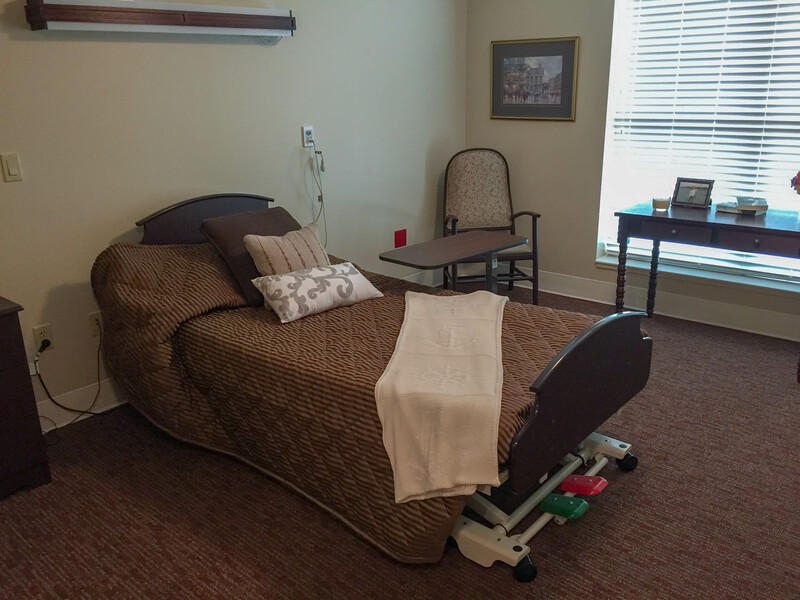 The Grand has all private rooms for a resident’s comfort and privacy as well as multiple locations throughout the center to engage in socialization or to just have time for oneself. 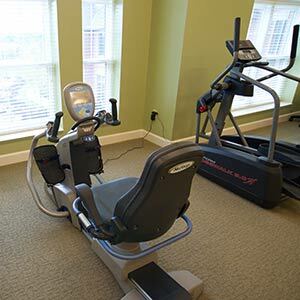 We strive to make our residents stay both physically and mentally stimulating as well as to have the best possible outcome for their well-being. Starting a gout diet? Understand which foods are OK and which to avoid. Gout is a painful form of arthritis that occurs when high levels of uric acid in the blood cause crystals to form and accumulate in and around a joint. Uric acid is produced when the body breaks down a chemical called purine. Purine occurs naturally in your body, but it’s also found in certain foods. Uric acid is eliminated from the body in urine. A gout diet may help decrease uric acid levels in the blood. A gout diet isn’t a cure. But it may lower the risk of recurring gout attacks and slow the progression of joint damage. People with gout who follow a gout diet generally still need medication to manage pain and to lower levels of uric acid. A good rule of thumb is to eat moderate portions of healthy foods. Weight loss. Being overweight increases the risk of developing gout, and losing weight lowers the risk of gout. Research suggests that reducing the number of calories and losing weight — even without a purine-restricted diet — lower uric acid levels and reduce the number of gout attacks. Losing weight also lessens the overall stress on joints. Complex carbs. 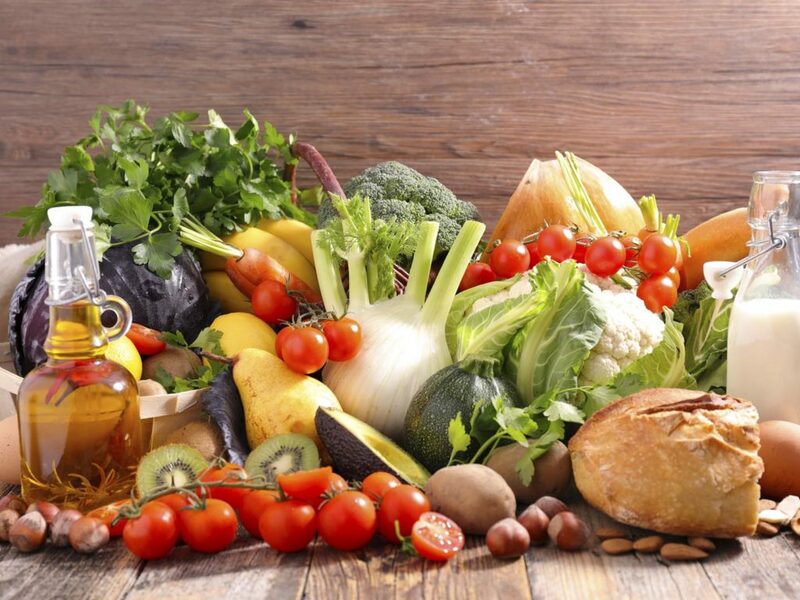 Eat more fruits, vegetables and whole grains, which provide complex carbohydrates. Avoid foods and beverages with high-fructose corn syrup, and limit consumption of naturally sweet fruit juices. Cut back on saturated fats from red meat, fatty poultry and high-fat dairy products. Focus on lean meat and poultry, low-fat dairy and lentils as sources of protein. Organ and glandular meats. Avoid meats such as liver, kidney and sweetbreads, which have high purine levels and contribute to high blood levels of uric acid. Red meat. Limit serving sizes of beef, lamb and pork. Some types of seafood — such as anchovies, shellfish, sardines and tuna — are higher in purines than are other types. But the overall health benefits of eating fish may outweigh the risks for people with gout. Moderate portions of fish can be part of a gout diet. High-purine vegetables. Studies have shown that vegetables high in purines, such as asparagus and spinach, don’t increase the risk of gout or recurring gout attacks. Beer and distilled liquors are associated with an increased risk of gout and recurring attacks. Moderate consumption of wine doesn’t appear to increase the risk of gout attacks. Avoid alcohol during gout attacks, and limit alcohol, especially beer, between attacks. Sugary foods and beverages. Limit or avoid sugar-sweetened foods such as sweetened cereals, bakery goods and candies. Limit consumption of naturally sweet fruit juices. Vitamin C. Vitamin C may help lower uric acid levels. Talk to your doctor about whether a 500-milligram vitamin C supplement fits into your diet and medication plan. Some research suggests that drinking coffee in moderation, especially regular caffeinated coffee, may be associated with a reduced risk of gout. Drinking coffee may not be appropriate if you have other medical conditions. Talk to your doctor about how much coffee is right for you. There is some evidence that eating cherries is associated with a reduced risk of gout attacks. Here’s what you might eat during a typical day on a gout diet. Following a gout diet can help limit uric acid production and increase its elimination. A gout diet isn’t likely to lower the uric acid concentration in your blood enough to treat your gout without medication. But it may help decrease the number of attacks and limit their severity. Following a gout diet, along with limiting calories and getting regular exercise, can also improve your overall health by helping you achieve and maintain a healthy weight. Home Evaluation completed by a Physical Therapist or Occupational Therapist is a necessary component of the treatment plan of care in a Skilled Facility. It is essential to ensuring a safe and successful return to the patient’s prior living situation. A home evaluation is usually scheduled 1-2 weeks prior to discharge and can easily be misunderstood by the patient and family as a signal that we are discharging. Careful education about the timeline and how goals can develop from seeing the person function at home, need to be reviewed. It is offered to everyone within a reasonable distance from the facility and helps to dispel the misconception that “when I go home, I will be able to things”. It presents a realistic picture of current levels of functioning. Exterior and Access to the Home: This section covers lighting, steps, handrails, locking/unlocking doors, opening/closing doors, getting the mail and other outside obstacles, tasks or barriers. This allows the therapist to assess the patient’s ability to enter/exit the home and manage assistive device in case of an emergency. Recommendations may be made regarding the addition of handrails or other safety features such as a ramp. Foyer and Hallways: This particular part of the evaluation assesses lighting, throw rugs, width of the hallways for walker/wheelchair, managing switches and other possible trip hazards. Kitchen: In this area, the flooring condition, accessibility of items to cook or eat with, storage/counter space, operation of the faucets/garbage disposal, dining space, retrieval of items from the stove, oven, microwave and refrigerator are examined. Therapists may recommend that items be placed between knee and shoulder level to improve safety and decrease risk of falls during kitchen tasks/IADLs. Additional equipment such as a walker tray or basket may be recommended at this time. Living Areas: the condition of the carpeting, any throw rugs present, sturdiness of the furniture as well as the height of seating for transfers are the foci of this part of the visit. Interior Stairs or Steps: Important factors include height of the step, presence of handrails, clutter on the steps, and carrying items when navigating the stairs. Bedroom: The therapist notes the condition of the carpeting or flooring, stability of the bed and other furniture, transfers on/off the bed, accessibility of clothing from drawers and the closet and the use of the blinds or window coverings. Bathroom: Components include lighting/presence of a night light, throw rugs, presence of grab bars, availability of supplies and ability to safely navigate throughout bathroom with reduced risk of falls. Therapists will assess ability to get on and off the toilet and into/out of tub or shower, recommending equipment as necessary. Basement/Laundry Area: Lighting, throw rugs, flooring and tripping hazards are assessed. Therapists observe the patients ability to reach and transport laundry items, retrieve clothing from washer/dryer and safely operate machinery. Telephone: The therapist will assess the availability of telephones and other emergency devices to assure that the patient can get help from emergency response personnel if needed. Fire Safety: During this portion of the home assessment, alternate exit routes are examined, fire sources are observed and smoke detectors are located. Recommendations are made to facilitate safety in case of a fire or other need to evacuate the home. The importance of the home evaluation should not be taken lightly or dismissed. It can be the difference between a successful, happy and safe return to home life for a long period of time or possible re-hospitalization from a fall or inability to manage essential components around the house. This month I’ll begin a series of articles focusing on some of the common classes of medications. I chose analgesics for this article. Analgesics are one of, if not the most common class of medications around the world. This class includes both prescription and over-the-counter medications, and opioids. Some references list NSAIDs (Non-Steroidal Anti-Inflammatory Drugs) as a separate class, but for our purposes NSAIDs will be included with analgesics. Please note that some medications are in multiple drug classes because they have multiple/different uses. Analgesics are medications that relieve pain, also called pain killers. They are distinctly different from anesthetics, which temporarily affect, and in some instances completely eliminate, sensation. Below are the medications in the analgesic class along with the most noteworthy facts about them. Acetaminophen (aka Tylenol; APAP) is sold over-the counter both alone and in formulations such as Nyquil. It is also sold as a prescription with codeine, hydrocodone and oxycodone. Over dosing on this medication can cause serious liver disease. Acetaminophen works by changing the way the body senses pain. Adults with healthy livers should take no more than 4gm (4,000mg) from all sources in a 24-hour period. People with liver problems should take even less. Aspirin (aka Ecotrin; Bayer) is sold over-the counter. Some also consider it to be in the NSAID class. Upset stomach is common when taking aspirin. Children shouldn’t take aspirin or any related medications (pink bismuth, loperamide etc.) because it is thought to play a role in causing a serious condition known as Reye’s syndrome. Opioids (narcotics), such as Avinza, Kadian, or MS Contin (morphine), Ultram (tramadol), Oxycontin (oxycodone), Dolophine or Methadose (methadone), Dilaudid (hydromorphone), codeine, Demerol (meperidine), Duragesic or Actiq (fentanyl), Lortab or Norco (hydrocodone), and others. Opioids reduce the pain signals sent by the nervous system and the brain’s reaction to those pain signals. If you take an opioid for a long time, you could develop dependence as your body gets used to the drug. Some people also become addicted to opioids. Talk to your doctor if this is a concern. One of the most common side effects when taking a narcotic is constipation. Nonsteroidal anti-inflammatory drugs (NSAIDs), such as Advil or Motrin (Ibuprofen), Aleve or Naprosyn (naproxen), Cataflam or Voltaren (diclofenac), Celebrex (celecoib) and others. NSAIDs are available as OTC and prescriptions, oral and topical. At The Grand we will make sure you have all of your medications available to you as quickly as we can; especially pain medications. It’s important to use them wisely to maximize your recovery time here! BIMS stands for Brief Interview for Mental Status. It is a screen used to assist with identifying a resident’s current cognition and to help determine if any interventions need to occur. BIMS is a mandatory interviewing tool for skilled nursing centers. A social worker is usually the one that would be administering the BIMS. There is a series of questions that are asked to the resident. These questions have a score value attached to them. The total score of all the questions range from 0-15. The numeric value falls into one of three cognitive categories: Intact, Moderate or Severe. The BIMS is another tool used to assist with providing the best possible holistic well-being to a resident. BIMS is administered shortly upon admission to a skilled nursing center. If a resident is in a skilled nursing center for long term care, then the BIMS would be administered at least quarterly. If an improvement, decline or significant change occurs with a resident, then another BIMS would need to be administered. If a resident is at a skilled nursing center for a short period of time, then the BIMS would be administered more often. A resident would typically be asked these questions shortly upon admission, after 14 days, 30 days and so forth. The objective of this interview is not to diagnose, but to assist with recognizing a resident’s possible need for further evaluation. It provides a baseline for a resident’s cognitive functioning. BIMS is divided into three sections. The first section looks at a resident’s immediate recall. The second section looks at a resident’s orientation. The third and last section looks at a resident’s short-term memory. BIMS can present as intimidating and/or invasive toward some residents. Since it is mandated that skilled nursing centers administer this, it is important to note that it is just one component of a resident’s MDS (Minimum Data Set) which is a combination of many assessments to develop an overall picture of a resident’s functioning. The MDS helps to determine a resident’s plan of care so that he/she receives the best possible care. BIMS is one part of the whole in determining the best possible treatment during a resident’s stay in a skilled nursing center. 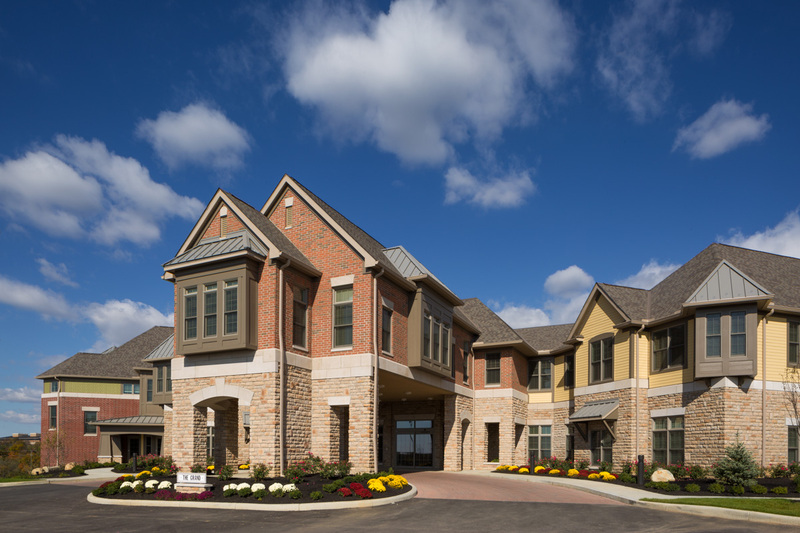 Here at The Grand, we strive to develop a cohesive treatment plan to maximize a resident’s strengths and assist with a resident’s weaknesses to provide the best quality of care. Skilled nursing is a type of intermediate care in which the patient or resident needs more assistance than usual. This setting is designated for physical, occupational, and speech therapies, to aide in strengthening the patient who has a goal of returning to their home at baseline. Skilled nursing services are offered to patients who need IV medications administered, who may have wound care needs, or who may need teaching on medication management, an example of this would be newly diagnosed diabetics. What is the difference between short-term care and long-term care? 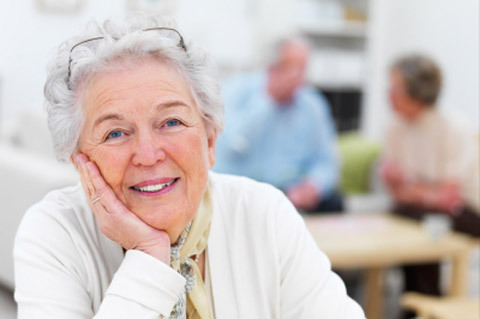 Short term care is a temporary solution that may last from a few days to a few months and is typically provided for rehabilitation and allow for recovery outside of a hospital. Long term care is typically utilized for in-house placement for the duration of the patient’s life, providing permanent custodial assistance. What social activities are offered? 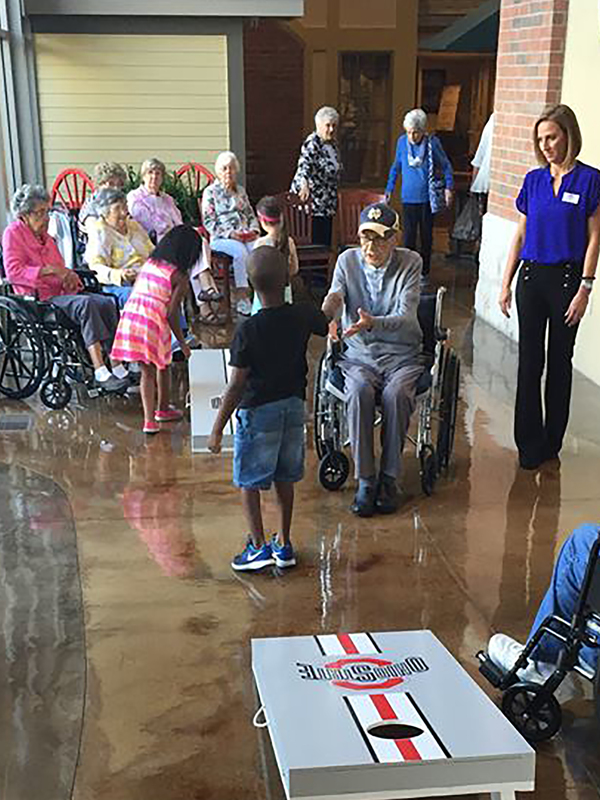 Skilled nursing facilities offer a full calendar of social events and activities. 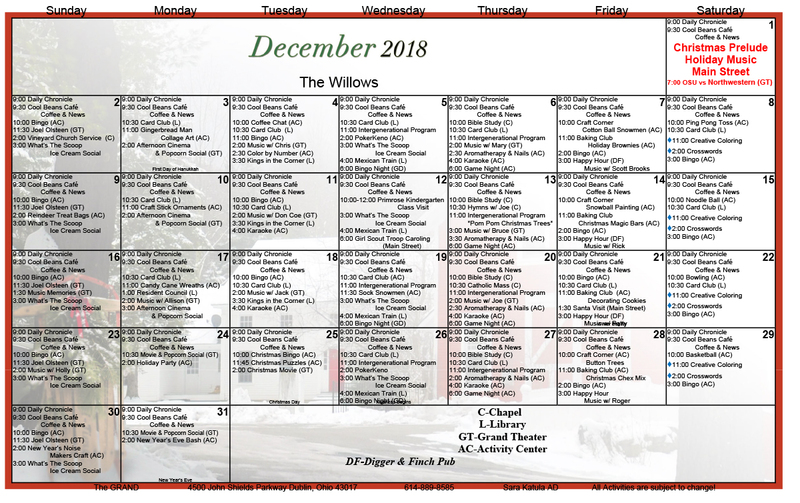 Residents are encouraged to join in as many activities and social events as they like. Some examples include; art classes, ice cream socials, bingo and cards, game and movie night, quest performers and church services. In addition, they offer wellness programs, exercise classes, beauty salons, small dining areas, café and restaurant style dining rooms, and outdoor sitting and walking areas. It is recommended that you bring comfortable clothing for working out in therapy along with well-fitting shoes. Personal hygiene items (all labeled with your name), photo ID, insurance cards, advanced directive paperwork (Power of Attorney and Living Will paperwork). Some facilities offer both single and double occupancy rooms. Each facility has its own characteristics which make it unique and sets it apart from the other down the street. An example; The GRAND offers single occupancy rooms with walk-in showers, individual heating/cooling units, refrigerators, Wi-Fi and cable. Patient’s medications are locked securely in each patient room and we strive to provide a home like atmosphere. Medicare part A covers skilled nursing care under certain conditions for a limited time. * You must have a qualifying hospital stay. This means you meet the minimum 3 night inpatient hospitalization requirement. * You have part A and days left in your benefit period. * Your doctor has ordered skilled services due to a medical condition which requires the need for 24/7 nursing care and therapy services offered 5 to 6 days a week. How do I find out what my insurance will cover? Insurance benefits and eligibility will be checked prior to admission to the building, but you may also call the member services number on your card and a customer service representative will provide you with details of your coverage options. What is the next step and what can I expect once I select a facility? Once you have selected a facility you will notify your hospital social worker and he/she will send the referral to the building for review. You may choose to tour the building. Your clinical is then reviewed by the admissions and nursing team to make ensure the facility can clinically manage your stay, and then the hospital liaison will visit you in the hospital to answer any questions you may have. If you need an authorization from your insurance to admit, the facility will then start that process. Once authorization has been received the facility will communicate with the hospital social worker. At The GRAND skilled setting, our ratio is 1:12 or 1:13, with an STNA on each hall. Our staffing ratios are significantly above average. How often is therapy provided and will I have a schedule? Therapy is provided at the discretion of your ordering physician, the therapy team, and your needs. You can ask for a specific schedule if that works better for you. At The GRAND, the therapy team will meet with you either the day of your arrival or the next day. An example, some prefer mornings, some prefer afternoons and some prefer to have their therapies separated. Meaning occupational therapy may be planned for the afternoon and physical therapy planned for the mornings. What sets your facility apart from the others? The GRAND offers several amenities that set us apart from our competitor’s. 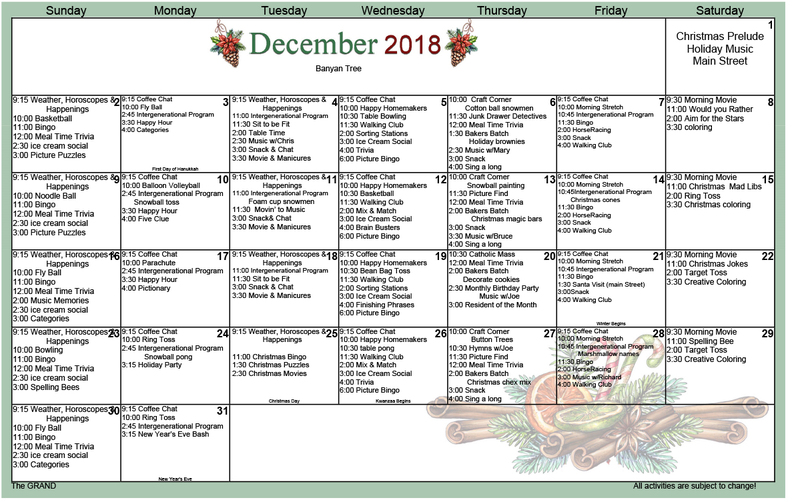 We have Digger and Finch pub, our ice cream parlor, Movie Theater, beauty salon, pharmacy, chapel, licensed in-house therapy team and team of dedicated nurses and STNA’s and low patient/staff ratios, we offer outstanding service to our residents. What are your visitation hours and/or restrictions? Each facility will have set hours of operation. The most common hours of operation most facilities follow are 8am to 8pm, 7 days per week. 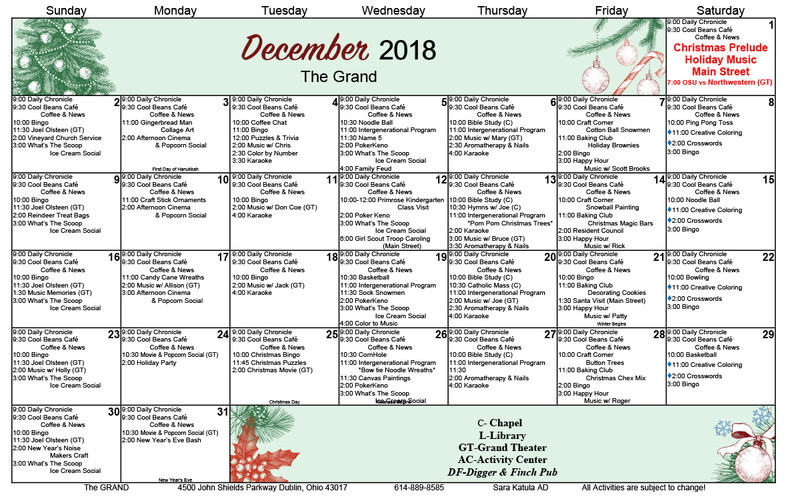 The GRAND’s hours are 8:30am to 8pm, Monday through Friday and 9am to 8pm, Saturday and Sunday. There may or may not be restrictions on when visitors can be with their loved one. The GRAND does not have such restrictions and provides security 7 nights per week. If you have ever had a hospitalization, the whole process can make you feel “a little off”. Most of us can fairly quickly return to our normal selves, but for many others something has changed with the ability to think clearly, concentrate or remember. Speech Pathologists at The GRAND of Dublin have been focusing on helping patients with Executive Functioning skills. These are skills which involve high level thinking, allowing individuals to function independently with all the specifics and decisions of daily living. Executive functions include: attention, concentration, memory, problem solving, sequencing, organizational skills and judgment. These areas can be easily affected by multiple medical situations, such as strokes, head injuries, poor oxygen levels, chemical imbalances in the body or anesthesia. At The GRAND on of the challenging ways, to improve these high level thinking skills is through multi-tasking and bilateral integration. Patients are asked to complete exercises that combine cognitive-verbal and motoric tasks in alternating physical and verbal patterns while crossing over the midline of their bodies. These tasks stimulate the brain to integrate movement and thoughts from both the left and right sides of the brain. When this takes place, gains are made across the board in all executive function areas, impacting the improved ability to think insightfully, problem solve complex tasks, improve memory and concentration and make sound judgments. These are the components necessary for an independent and safe return to the patient’s home environment. That is the goal for patients and families in Rehab at The GRAND of Dublin, and addressed by our expert, experienced Speech Pathologists are trained in the specifics of remediating these impairments. To learn more please contact the therapy department at The GRAND of Dublin by calling 614-889-8585 today. We all know the flu virus can be deadly to vulnerable populations, but did you know that in 1918 a worldwide flu outbreak caused illness and deaths in many young and healthy people, as well as those at high risk? This particular strain of the flu became known as the Spanish flu because it was well known that Spain was hit particularly hard, but before the end of the 1918 flu season the virus had spread to every corner of the globe and killed up to 50 million people. The particular strain that caused the 1918 pandemic was of avian origin, as were many of the most deadly flu outbreaks. The first flu vaccine in America was released in 1940, so at the time of the Spanish flu there was nothing to stop its spread except good hygiene disinfectants and isolation those who fell ill. Today we not only have a vaccine for the flu, we have diagnostic tests and we have prescription medications to help treat the virus, as well as lessen the symptoms and duration of the illness; some can even be taken to prevent the flu in people who have been exposed to the virus: we have Tamiflu (Oseltamivir) oral capsules and liquid, Relenza (zanamivir) inhalation powder and Rapivab (peravimir) injection. In 1960 the U.S. Public Health Service first recommended annual flu vaccination for high risk groups. This year the Centers for Disease Control recommend flu vaccination for everyone 6 months or older who do not have contraindications. 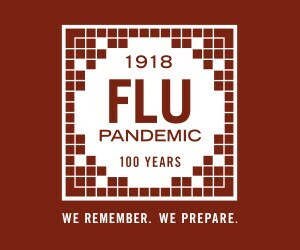 So much has changed in the prevention and treatment of the flu in the last 100 years! At The GRAND of Dublin we offer flu vaccines to all of our employees and residents every autumn, and we still have plenty left this year if you need one during your stay with us. For more information on the 2018 / 2019 flu season Centers for Disease Control and Prevention website. 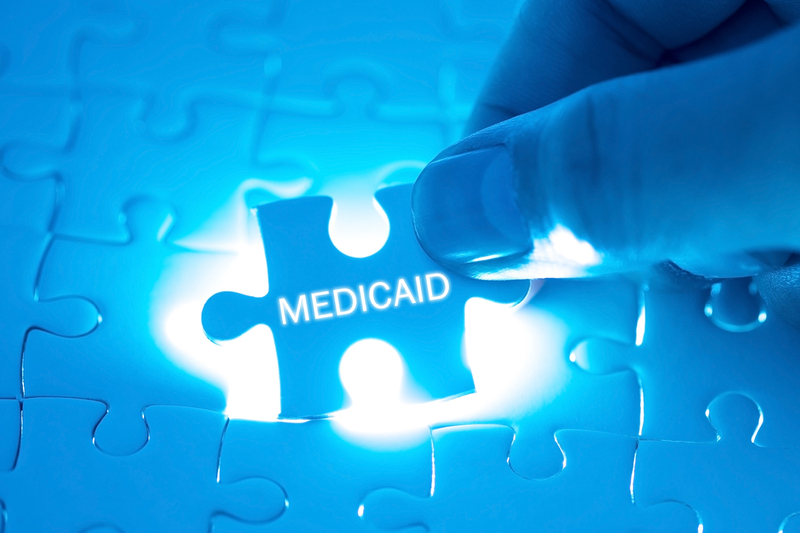 What does your Commercial or Managed Medicare insurance mean for your rehabilitation stay? It important that you understand how your coverage effects a variety of areas of your stay in a short term rehab facility, from admission, to type of room, to amount of therapy you receive to per day/week, how much it will cost you out of pocket, up to your prospective discharge date. If you are looking for Skilled Rehab for yourself or a loved one it is important that you educate yourself on what coverage you have. A lot of times the Business Office at your prospective Facility has access to this information and can help you understand your coverage. Most Insurance providers require precertification for you to even come to a Skilled Nursing Facility. This is done by the facility, with the paperwork provided to them from the hospital. Some insurance companies will only authorize a Semi-Private room (you’re bunking up with a stranger for your rehabilitation stay). A request is submitted to the insurance company and they generally take 24-48 hours to respond (they don’t always say yes). You cannot transfer to the facility until the service is authorized. Once the hospital and facility are notified of authorization, the hospital will then arrange transportation to the rehab center. Many Insurance companies cover 100% for the first twenty days, following a more Medicare-like guideline. The will have a set amount or percentage due per days for days twenty one on. Other insurance plans have a deductible due up front and a daily coinsurance starting on day one of admission. Almost all Insurances have an amount that you have to reach paying privately before they pay your services at 100% with no Out of Pocket cost. This is known as your annual Out of Pocket Max. Some Insurance companies have a “Level” that they assess your rehab need at. This level dictates the amount of nursing care and therapy the facility will provide to you on a daily/weekly basis. (Example: Anthem Level 2 covers 90 minutes of Therapy no less than 3 days per week, where Anthem Level 3 states 90 minutes of Therapy no less than 5 days per week). So you might come into your Rehab stay thinking that you will have therapy 5-7 days per week, and might only be seen 3 times a week because that is all your insurance has authorized the facility to treat. On a regular basis your Insurance Company will ask for updates from the facility. These updates include nursing and therapy notes documenting your progress (or sometimes lack of progress). At any point that insurance company can decide that you are ready to go home, or no longer meet skilled criteria and are in need of Long Term Care which is not covered by the insurance. Managed Medicare Insurance plans will issue a “Notice of Medicare Non-Coverage” giving you AT LEAST a two day notice. They are not required to give you any more notice than 2 days that you will no longer be covered your skilled stay. If you have a commercial insurance plan, they do not have to follow Medicare guidelines and do not need to give you any notice. A commercial plan might review your update, and say we are going to stop paying effect the previous day. It is on you to discharge or pay privately at the facility if you stay. With all of the different types of Insurances and Plans out there it is important to do your research before selecting one for yourself. If you do find yourself in a situation where you don’t know your coverage or have questions, call your insurance company, talk to your hospital social worker, or the Business Office at the Rehab facility. We all have a plan in mind of how everything will work out perfectly. Unfortunately your insurance company (and life) doesn’t always follow that perfect plan. Make sure you are doing your homework, so things don’t come up and leave you so shaken that is sets you back in your progression to home.